At the end of the French Revolution of 1789, historian R. R. Palmer wrote that “The wars of the kings were over; the wars of the people had begun.” Today, this maxim threatens to be reversed. Although increasing Chinese and Russian assertiveness towards the West leads many to question whether the international system can accommodate these so-called Great Powers, the only real conflicts of interest are between undemocratic leaders and their people. Around the world, the liberal international order has vastly increased the security of nation-states, minimizing the existential threats which John Mearsheimer believed caused the “tragedy” of Great Power conflict. Yet in the process, it has reduced the security of illiberal regimes, namely those in Beijing and Moscow. The resulting outbursts superficially resemble a return nineteenth century Realpolitik, but there are in truth no more Alsace-Lorraines, places in the sun, or zero-sum interests worth the bones of American, Chinese or Russian grenadiers. Unfortunately, the short- to medium-term may see the obsolescent kings take a final stand at the expense of their nations and ours. To contain them, the US should not fall for cries of inevitable Great Power rivalry and instead remind the citizens of these nations of their many shared interests, and single common enemy. Many observers today misguidedly conclude that the Great Powers are only those states which appear to challenge the United States, namely Russia and China, giving rise to the illusion of resurgent rivalry. This definition is circular. John Mearsheimer’s original definition of a Great Power hinges on relative capacity (possessing “sufficient assets” to mount a conventional threat to the most powerful state), and should expand the number of peaceful countries which could be considered Great Powers. If we consider Russia a Great Power (as Mearsheimer does) and take its level of economic output and technological sophistication as a baseline, there are dozens of countries which we could be considered Great Powers if they chose to trade their butter for guns. Why do they not? International institutions based on territorial integrity and underwritten by a non-imperial hegemon have reduced insecurity to such low levels that many states feel comfortable reaping the benefits of participation. Despite Beijing and Moscow’s espousal of exceptionalist rhetoric, there is no reason they should prove an exception to this rule. Russia is not much larger by territory than is Canada, nor China than India by population. Imperial histories cannot account for their behaviour either: former US enemies with a history of brutal conquest such as Germany and Japan have become generous contributors to the order. Even though the current world order has had the effect of increasing the security of nation-states, it has also reduced the security of particular regimes. Domestically, uncertain or shifting foundations of legitimacy keep leaders constantly on their toes. In Russia, weak constitutionality and the lack of a positive national identity (rather than the negative identities of not-fascists and not-the-1990s) loom over the Kremlin. Beijing’s mandate for growth is no less uncertain. Internationally, fears of regime change are compounded by the implicit favoritism of the international order towards democracies and the West’s explicit attempts to promote democracy in the two countries. China’s 2015 Military Strategy document, for example, references “anti-China forces” threatening to “instigate a color revolution” — a classic Russian bogeyman. Recent assertiveness may thus be defensive, but what is being defended is the regime, not the state. The gratuitous nature of Russia’s recent behaviour vis-à-vis the West confirms that what we are witnessing is friction not between Great Powers but between a leader and his people. Until 2014, Russia’s military strategy was well-known for remaining “below-threshold,” working indirectly so as to preclude an American response. The annexation of Crimea in 2014 in violation of the paramount Westphalian principle of territorial integrity, however, can hardly be called below-threshold. Indeed, the duration, scale and intensity of human rights atrocities in Ukraine has had an effect entirely opposite to depoliticizing the Ukrainian people and turning away Western interest, as has been the goal in creating previous frozen conflicts. Perhaps this was merely a miscalculation by a paranoid and solipsistic Kremlin, but the West’s reaction may also have been a welcome narrative foil. Indeed, the almost amateur overtness of Russian cyber-attacks and disinformation campaigns in the 2016 US election suggest a strategy of “reflexive control,” where the intended effect is contained not in the act itself but in response to it. A new Red Scare in the West serves the triple narrative purpose of casting Putin as a “geopolitical genius,” dampening trust in democracy in the West, and reinforcing a narrative of encirclement to his people. It may come at the cost of a renewed threat from the West, but the traditional realist concerns of Great Power rivalry do not worry Putin. To the contrary, they simply legitimate Russia as a Great Power. Unlike Putin, Xi has made his best effort not to provoke Western interest in China or its near abroad, because he understands that conflict with the West is not in his regime’s best interest. Even Beijing’s more assertive actions in the South China Sea appear oriented towards preserving important shipping routes, and experts agree the main risk is of miscalculation, rather than a calculated attack. Beijing understands the acute tradeoff between military and economic influence in its near abroad produced by US security guarantees, and for now has sided decisively with the latter. In the short run, the result is that China looks less like a rival Great Power than does Russia, leading many analysts to believe that it can be accommodated in the liberal world order. Certainly, China’s national interests in economic development, technological transfer and peripheral stability are well served by current international system. Yet the Chinese Communist Party’s interests may not be. The United States’ drive towards “open societies, open governments, [and an] open international system” acutely threatens the CCP’s insular governance model. Concern for human rights impedes Beijing’s ability to suppress Uighurs and Tibetan nationalists. Trade regulations preclude subsidizing politically relevant industries. Even China’s ‘core interest’ in Taiwan is all about a threat to the CCP, not to mainland territory or the Chinese nation. There is a reason that Beijing’s “New Option” of international order diverges only from the current in its tolerance for tyrants: it addresses parochial threats to the regime, not the nation. The resistance which China and Russia pose to the current international order thus should not be overstated. Moscow, for its part, struggles to define its leadership beyond opposition to the West and “fascists” in the near abroad, delusions which must be sustained by a phantasmagorical internal media environment. The West is a stage upon which the regime can enact Surkovian fantasies — not a strategic adversary. It is no coincidence Putin’s most bellicose (and fanciful) national address came less than two weeks before the country’s 2018 national election; we can only imagine the proportions such dog-wagging may take in an election which is actually contested. Although we may therefore see a spike in aggression nearing 2024, Russia ‘bez Putina’ has no vital interests which should lead it into Great Power conflict with the West. Even regarding the sensitive issue of Ukraine, what was at stake in the 2014 invasion were more likely oligarchs’ dachas than a direct threat to the Russian homeland. The semblance Great Power rivalry with Russia is no longer the sustained danger of a Red Giant, but the gas of a supernova emanating from a densely concentrated core. China, however, poses a more systemic long term threat because it asserts its own center of gravity without relation to a Western antipode. Should the basis of the regime’s legitimacy shift away from GDP growth, Beijing may choose to take on the Western model either for reasons of ego or preemptive insurance. The US and China certainly find themselves in a trap similar to that between Sparta and Athens, albeit not because one is rising and the other is falling. Instead, on one side are the people, and on the other, an uneasy king. Given that the figment of Great Power rivalry will persist as long as Putin and Xi project onto it their own insecurities, the US has two policy options: insure the regime, or remove it. The former would contradict America’s values, pitting the US at odds with the Russian and Chinese publics, but we have done worse for allies such as Saudi Arabia in the Middle East. But even then, it is not clear that US reassurances would be credible given that encirclement is a permanent talking point on Xinhua and RT. The latter option of regime change, whether direct or indirect, is no less fraught and undoubtedly costlier even if it succeeds, and would set a dangerous precedent. America’s best hope is that democracy springs peacefully and endogenously in both countries, yet these are unsatisfying odds. Nonetheless, the US should continue to capitalize on its soft power pull to educate a new generation of leaders and civil society activists from both countries. It should remind Russian and Chinese citizens that the American people have no fundamental conflicts of interest with them — in other words, that Great Power rivalry has not returned — and back this up with explicitly targeted sanctions which expose corruption and wrongdoing in the countries’ leaderships. The Global Magnitsky Act is a powerful first step in this direction, but care should be taken that it not only target dispensable boyars. Future US leaders must single out the tsars responsible for stoking the very avoidable tragedy of Great Power politics. Mearsheimer, John J. The tragedy of great power politics. WW Norton & Company, 2001.pp. 5. “China’s Military Strategy,” White paper, The State Council Information Office of the People’s Republic of China, May 2015. In 2008, Russia did not attempt to annex Abkhazia and South Ossetia, nor did they do so in the disputed Nagorno-Karabakh region between Armenia and Azerbaijan. See also The Kremlin Playbook: Understanding Russian Influence in Central and Eastern Europe. Center for Strategic and International Studies. 2016. McKew, Molly K. “Russia Is Already Winning.” Politico Magazine (2017). Ambassador J. Stapleton Roy, “The Changing Geopolitics of East Asia,” Working Paper, Yale Law School, April 14, 2016. Anne-Marie Slaughter, “How to Succeed in the Networked World: A Grand Strategy for the Digital Age,” Foreign Affairs, November/December 2016. Graham Allison. 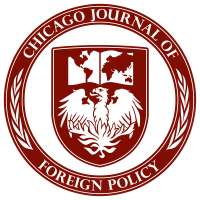 “China vs. America: Managing the Next Clash of Civilizations.” Foreign Affairs. 2017.